Twitter is a wonderful tool for quick shout-outs, headlines and direct communication with your fans. This may not seem like an immediate issue, but this is really serious. Why? Think about if you had received a spam message, what would you do? You’d worry that your account is hacked. You’d worry that the message would affect your account. You’d think that the person who sent it to you is not updating and keeping up with their twitter account. And you would probably un-follow them. This is a threat to you as a musician if you have a Twitter account that is spammingfollowers left and right. You are easily risking un-follows and more importantly, losingtrust from fans in your account. If you are on this side of the fence and are sending these spam messages to yourfollowers, here is how you can stop it right away the first time. 1. Go to Settings > Applications. 2. Deactivate ALL applications that you are not using, even if it seems harmless. Applications are usually authorized when you first sync them to your Twitter account to post and message on your behalf. Outdated or ones you are not using probably were hacked and therefore sending spam in your account. 3. After you’ve deactivated unnecessary applications, change your password. Usually folks think that only changing your password will stop the spam, but with my experience, you need the combo of deactivating unused applications and changing your password. · Sorry, everyone! Account was hacked – ignore all strange DM from me! · Man, got hacked. 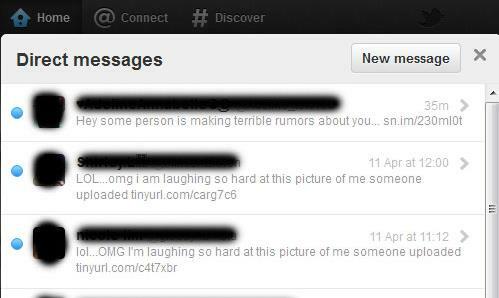 Please ignore/delete all strange DM sent from me! Sorry to everyone! · My apologies to everyone – was hacked and sent strange DM to a bunch of you. Please delete! If you caught it in time where only a few DM were sent, it would be worth it to mention people in your tweet to make it more sincere. However, everyone will understand the general apology if you were hacked and sent 100s of spam DMs!